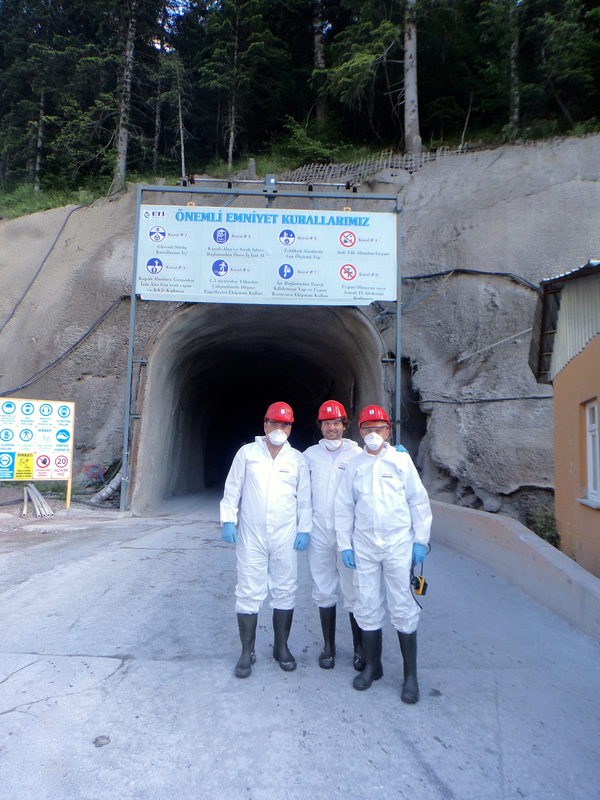 The underground mine in Küre in the northern part of the Turkish province of Kastamonu in northern Anatolia uses 134 of them. There are 182 electrical submersible pumps of the Tsurumi KTZ series in operation in this 980m deep mine forming the backbone of the dewatering system. Whilst the workers and equipment are moved via lifts, the pumps' task is much more difficult, but this is precisely why Tsurumi designed this series. The delivery program lists 13 different versions of this universal aggregate made of resistant grey iron. They can move between 430 and 2440 litres per minute at a maximum pumping height of 48.5 metres. The most common pump used in the mine is the KTZ35.5 (there are 47 installed): this is a medium-performance pump with a motor output of 5.5 kW allowing it to pump a maximum of 32 metres and up to 1100 l/min. Due to its dry weight of 76 kg, it is possible for several people to move it together. The dewatering process is also supported by 37 of the smaller KTZ32.2 pumps and 27 aggregates of the sister series KTZE which has a level controller. These pumps control themselves automatically. The controller, which has no moving parts, opens and closes the pump depending on the pre-selected water level. This discontinuous process saves electrical energy and prolongs its service life. The mine has been equipped with 26 of Tsurumis' much more powerful LH series to move water through higher distances; this selected configuration can pump water up to 132 m.
The operator Eti Bakir A.S. has offices on site and is very satisfied with the choices he made. According to Eti Bakir, the pumps have operated without a problem, despite the difficult conditions at the site. There are approximately 600 people in the company's copper division working round the clock at the site in three shifts. Most of the excavated material is processed in Samsun, which is located to the east. Around 200 men enter the mine every day. Eti Bakir removes around 1.1 million tonnes of copper ore, 400,000 tonnes of pyrite and 110,000 tonnes of copper from its mine in Küre. There is about 2.5 kg of ore in every tonne of material removed. The level of purity after the material has been processed in Samsun in compliance with ISO 9001, on the only system of its kind in the country, is 99.95%. Tsurumis' local dealer Bilgi Mühendislik Ticaret A.S. located in Istanbul supplies the pumps and trains the equipment maintenance crew at the mine. Bilgi reported that it was important to the customer that the service life of this Japanese equipment is long and that maintenance procedures are simple. In contrast to other manufacturers, Tsurumi pumps are built using a service-friendly modular system with lots of identical parts throughout the entire delivery program which simplifies the supply of spare parts and binds less capital. This means that lots of customers are able to carry out work themselves on site, according to Bilgi. Technical details such as the patented forced lubrication, separately cast electrical conductor to prevent water penetration and the use of ultra-hard materials, for instance silicone carbide, are just some examples of the reliability of the design. The dealer believes that this is one of the decisive reasons for many operators whose companies run around the clock. Just in case, Bilgi has set up a 24 hour standby service - this rounded off the whole package for Eti Baki. The Tsurumi European headquarters considers this company to be a key account in the region, even though it is by far not the biggest user: the manufacturer once delivered more than 650 pumps to a single project. You can watch the impressive video of the pump used in Küre online at Youtube.com/tsurumi.